published directly in paperback form) when  compared to his novels? Yes, that is all interesting, and most interesting of all is that Burns can tell you so much about a writer I imagine very few of us have heard of, let alone read. But what other old beboppers, certain though they might be that the great Lester Young, while an influence on Parker and Gillespie, didn’t himself play bop, would know enough to produce ‘Finks: The CIA and Writers’, one of the most interesting (ha!) essays in PPP? This essay, ostensibly a review of two books, Finks: How the CIA Tricked the World’s Best Writers, by Joel Witney, and John Rodden’s Of G-Men and Eggheads: The FBI and the New York Intellectuals, ought to be required reading for all those who, as I write, and prompted by the Salisbury poisonings, are making proud contrasts between the truth-telling West and the lies of Putin’s disinformation machine. I’m not here to defend Putin. He’s a murderous liar right enough. But Western governments as fearless voices of Truth. Johnson? Trump? I’m old enough to remember the arguments that erupted in the UK – in intellectual circles at all events – at the beginning of the 1960s when the journal Encounter, edited by Irving Kristol and Stephen Spender, turned out to be funded by the Congress of Cultural Freedom, a front for the CIA, who also financed The Paris Review, and, believe it or not, the once left-leaning Partisan Review, though by then it was edited by Norman Podhorotz, who’d abandoned his earlier radicalism life as a neo-con. Did it matter? After all, the three journals were, or seemed to be, free-standing cultural enterprises. You bet your boots it mattered. Burns quotes a CIA operative Tom Braden’s response to a statement put out in 1967 by a number of contributors to the Partisan Review, in which they disclaimed any knowledge of CIA funding of ‘literary and intellectual publications and organisations.’ ‘Of course they knew,’ Braden said. In England Spender also claimed to be a blue-eyed innocent. I remember reading that at a party in London a well-wined William Empson followed Spender around taunting him with being a paid lackey of corrupt sources until the two finally came to blows, or what, given the drunkenness of the one and the unathletic ways of the other, was more probably a general flapping of arms, though I recall being told by someone present that at least one of the antagonists fell to earth, he knew not where. More seriously, the issue was one of editorial freedom – or lack of it. Which, for example, meant not so much who was published in Encounter as who wasn’t. There were certainly mutterings at the time that left-wing writers were unlikely to be welcomed to the journal’s pages, and this was before anyone knew about the post-war list Orwell had drawn up for M.I.6 (I think) of ‘known’ communists who could be considered enemies of the state. Burns’ conclusion to his fascinating piece, that nothing can ‘excuse the machinations of the CIA when it came to secretly financing cultural activities because of their usefulness in showing how the West was superior to Russia and her allies,’ is spot on. ‘Finks’ comes toward the end of Painting, Poety, Politics, and precedes a number of pieces about political matters, including a penetrative account of ‘Angel Meadow: Britain’s Savage Slum’ (a sizeable review of a book by Dean Kirby on a particularly brutal nineteenth century Manchester slum area), as well as a fascinating piece on 1919: Britain’s Year of Revolution, by Simon Webb. This begins: ‘My father, who was in the Royal Navy from 1913 to 1925, served on the Battleship, HMS Valiant, at one point’, and goes on to tell us that the ship, accompanied by two destroyers, sailed up the Mersey in 1919 in order to act as deterrents against ‘those who were thought to be have been planning some sort of revolutionary activity.’ Characteristically, Burns adds that he doesn’t know if his father was on board at that time. The habit of truth-telling and personal information typifies much, if not all, of what Burns writes, whether he is engaged with commenting on his responses to painting, poetry, or political matters. Quite without intrusive, egotistic breast-beating, he nevertheless makes no attempt to disguise his own convictions, which are those of an honourable democratic socialist. ‘Personally,’ he says in a piece called ‘Essayism’, ‘I enjoy reviewing, especially when I have the opportunity to extend what I’m writing to a review/essay.’ What makes his essays so valuable is his ability to blend personal knowledge and commitment with the reviewer’s duty to report as fairly as possible on the subject and/or author under review. 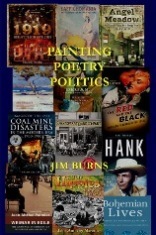 In PPP he writes about matters as varied as the errant life of Hank Williams, Australia’s Impressionists, and Coal Mine Disasters in Britain – to choose at random from the more than forty pieces that make up this, the latest of his ten (ten!) essay collections – and, it hardly needs saying, wherever you open the book you find something worth reading. Dr Johnson doesn’t give the word ‘interesting’ in his Dictionary, but we can guess the meaning the great man would provide for the term from how he defines the verb ‘To interest: To affect; to move; to touch with passion.’ This may seem a shade strong for Burns’ characteristically wry prose. But the wholeheartness of his engagement with the world of arts and ideas is unmistakeable. Interesting? I’ll say.